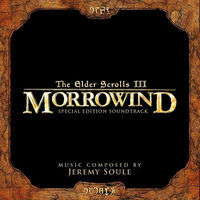 Morrowind's soundtrack was composed by Jeremy Soule, who also composed Oblivion's soundtrack and Skyrim's soundtrack. It is available for purchase from iTunes and DirectSong. The soundtrack was nominated for the Outstanding Achievement in Original Music Composition award of the Academy of Interactive Arts & Science, but lost out to Medal of Honor: Frontline. In a waking moment from a dream, familiarity somehow coexists with a strange newness that can overwhelm the senses. Anything tangible is overtaken by the feeling of being in two worlds, neither of which are distinct. This music was my impression of that state. It was an approach meant to diffuse aural focus in a shift to the visual nature of the Morrowind adventure. Melodic beats (which typically give strong narrative direction) were replaced with harmonic color, and the world becomes a dream. For this directionless frame of mind leaves an opening for many interpretations, all reinforcing a personal connection to the game. Most tracks were given a title on the soundtrack CD ("Original Title") included in the Collector's Edition of Morrowind, and later another title ("Remastered Title") when Jeremy Soule released a remastered version of the Morrowind soundtrack on DirectSong. The Original Title also corresponds to the 15-track CD seen on sites such as this one. The remastered album also contains three additional tracks and modified the order. 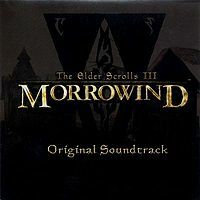 Although the soundtrack is available for purchase from DirectSong, the same music can be found in the Morrowind data folder in MP3 format, except for Darkened Depths, The Prophecy Fulfilled, and the title theme reprise. Also, Introduction is not available as an MP3 in a Morrowind installation, but is embedded in the mw_intro.bik animation file played when starting a new game. Desperation and Call of Magic are available for download on the official site. Six songs from the soundtrack are featured in Shadowkey. All explore songs from the soundtrack (except the title theme, Call of Magic/Nerevar Rising) are featured in the Dragonborn add-on for Skyrim. ^ Jeremy Soule, Facebook, December 12, 2015. ^ Jeremy Soule, Facebook, October 5, 2014. ^ Jeremy Soule, Facebook, July 25, 2015.